Versatile carbine for close quarter fighting. Introducing the DEVIL series AEG. 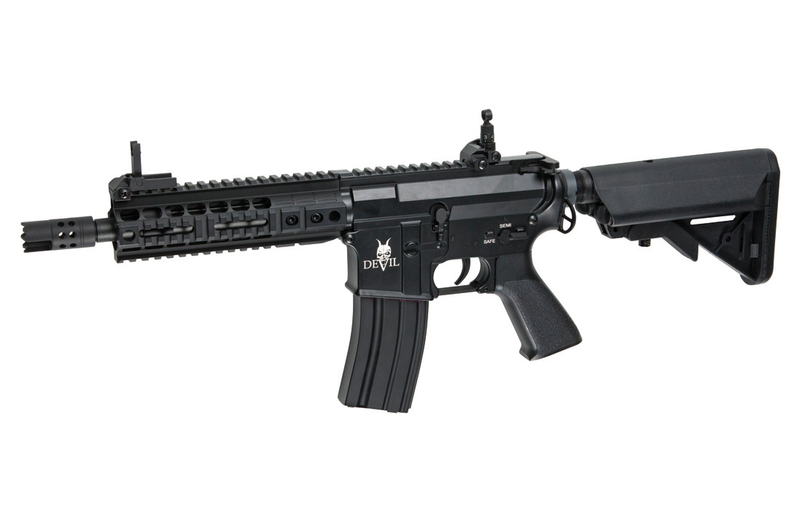 This new Proline airsoft gun is a breath of fresh air in the crowd of conventional looking M4s flooding the ranges. Many subtle design details sets the DEVIL AEGs apart from a standard M4. The sturdy upper receiver displays an angular shape providing a more modern look. The sleek ergonomic pistol grip has a palm swell and a textured surface for better grip. Internally is where the DEVIL series, really stands out. MIM gears running in 8mm bearings, metal cylinder and piston head. A piston with metal teeth and a quick-change spring guide w. bearing, that accessible by easily removing the stock tube. Finished off with low-resistance silver wiring for optimized conductivity to ensure the DEVIL series delivers one HELL of an experience. Quick-change spring guide w. bearing, accessible by removing the stock tube.